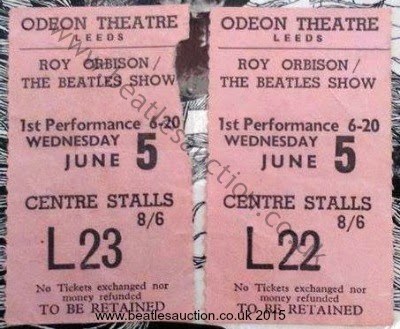 These ticket stubs are for the first performance of the day of the Roy Orbison/Beatles tour at the Odeon Theatre in Leeds on Wednesday 5th June 1963. At the time Roy Orbison was topping the bill and the Beatles' set consisted of around six or seven songs including Love Me Do and Please Please Me. The tickets are going to be up for sale in our 2015 Liverpool Beatles Memorabilia Auction this August. The estimate is currently £100-£120 each ticket.